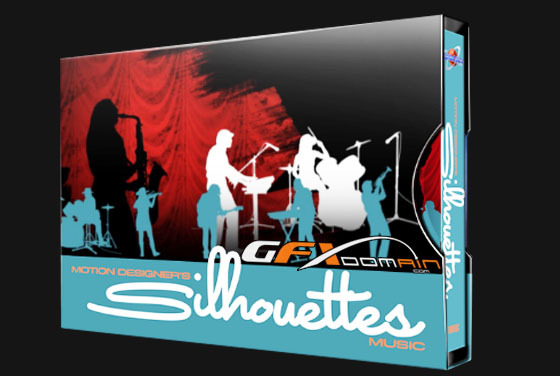 MD’s Silhouettes Music – With this library you can give your video and motion graphics projects the lively feel of an actual musical performance. 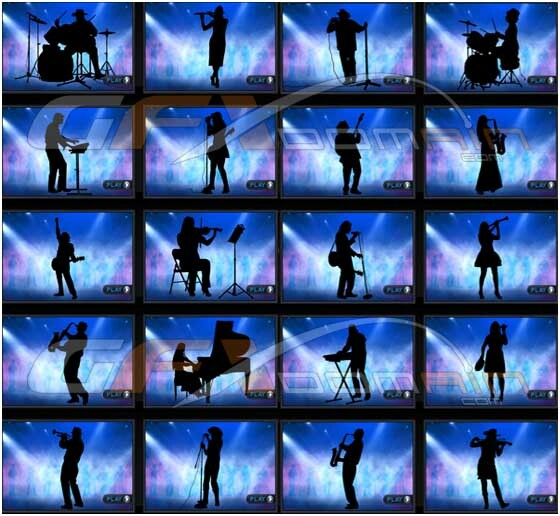 This exciting new library of crisp, clean live-action Silhouettes brings you an array of male and female musicians from a variety of musical genres performing with musical instruments. These live-action clips can help you breathe life into any project by telling a story with fluid motion and graphic boldness. They can help you draw the focus to the soundtrack of your project, while enhancing the flow and rhythm of your video. These silhouette sequences will help you step it up by adding a funky edge and a cool rhythm to your work, giving you the best of both worlds – the fluidity of real life and the sharp graphic symbolism of an animated silhouette – all in a drag-and-drop element that even a novice motion designer will find easy to integrate into any project. Turn your projects into a party! Express a thought, evoke an emotion, or convey an idea without adding the complexity of an actor’s features or clothing to detract from the simplicity of your message. Captured live in the DJ green screen studio, on a RED ONE at 3K resolution, these clips were shot under very controlled conditions, specifically for the purpose of making Silhouettes. Each clip was then meticulously hand-rotoscoped and keyed to achieve the highest quality possible results from the high-resolution source material. • 31 ready-to-use pre-masked Quicktime Silhouettes clips: You get a variety of action clips, all with the ease of a drag-and-drop motion design element. • Shot on a green screen using a wide variety of professional dancers and props under controlled conditions: You get the fluidity of live action and realistic human motion without the complexity of color or specific facial expressions or clothing styles. • Footage captured at high resolution using a RED ONE camera: You get the highest possible professional quality clips with sharp definition and fluid motion. • Meticulously hand-rotoscoped and carefully keyed silhouettes: High resolution elements with crisp, clean mattes give you a professional edge for even the simplest of projects. • Three resolutions provided for each clip: Low, Medium and High: Up to 3000 pixels, Up to 1500 pixels, and Up to 500 pixels. You get even more drag-and-drop simplicity for any type project, whether for an HD commercial or a splash screen ad for the web. We’ve done the work for you in scaling these clips down, ensuring along the way that the edges and details in each clip stay clean and crisp. Sorry, but how can i use the datas inside the rar-file ? ?